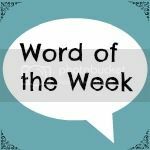 Share the post "Word of the Week 27/2/15"
Hello and welcome to Word of the Week! Thanks to those of you that linked you last week, and being so patient with my blog playing up, it was lovely reading all of your posts. It’s a pleasure to have you all here. Oh yes, it’s been all about this, this week, and it’s not something I’m especially good with! As many of you will probably know from trying to link up last week, I had problems with my hosting last Friday into Saturday. It resulted in me upgrading the package, after too many queries and ‘live chats’ for my liking (I wanted to just spend time with Boo as she was at home), but I am hoping it will now make a difference. Time will tell, I guess. That also happened to be the day that my phone upgrade was due, a day that I’ve been counting down to, as I explained in my post Bye, Bye, iPhone. So I’ve spent time researching new phones, finally choosing the Sony Xperia Z3, then looking for the best deal, then getting the best deal sorted and then finally getting the phone! In between the upgrade and phone’s arrival, they switched my 3G off, so I was without technology for the weekend. This bothered me initially, and then I found it rather freeing. I did miss Instagram, though! Since my phone’s arrival, I’ve been getting to grips with the change from iOS to Android, downloading new apps and transferring data. Oh, the excitement! So technology has taken up a lot more of my thoughts and time this week than I’d normally give to it. Glad it’s not like this every week! I like it, and am now getting used to it. Not missing my old phone anyway! Technology is wonderful when it’s all working but if not, it’s a reminder how much we all use it, isn’t it. Hubbie upgraded to a Xperia M2 this week and whilst he’s taking a while to get used to it, I think it’s great, shame I’ve only just upgraded! Oh Happy new phone! :), I Look forward to your opinion on the Experia, they seem to get good reviews. Hope your blog is running smoothly now too. It’s always fun to play around with a new gadget, finding out what your phone can do, the apps and all. Exciting! #wotw. Ooh a new phone to play with! where would we be without technology! What a great idea for a linky, I will now start writing a word of the week post for Saturdays to link up (glad it is open for a couple of days), it’s a brilliant way to explore words you are not familiar with etc. Thank you. I hope you are having fun with your new phone! Very exciting! I’m linking late today, but I wanted to link as you are the one who inspired my post today. I have (finally) reviewed my ‘about’ page and your advice was invaluable. You’re brilliant at sharing all your great tips and tricks. It really gave me direction to have your list, and when I realised my ‘about page’ would be way too long, I wrote the post linked. Thank you thank you. I hope I’ll see you again at BlogCamp in April. Really looking forward to it! Technology is great when it works flawlessly. When it starts playing up, it’s just a nightmare. The only reason I always get iphones is to avoid just that. You are one brave lady! I have to get a new laptop as mine is slowly dying, and I am dreading it! It’s when technology fails us that we realise just how much we depend and have become attached to it isn’t it? I’m happy with it, it’s a whole new world!